What’s your biggest accomplishment? Creating a business from the ground up and making it my full-time career. This summer I celebrate 8 years of being a full-time photographer. I am grateful that I get to do what I love and earn a living at the same time. Getting married and buying a home with my husband are my biggest personal accomplishments. I feel very lucky! 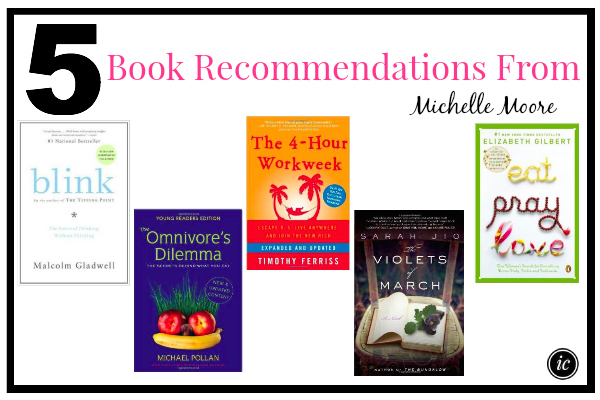 I love to read so I’ve listed five for you – it’s a well-rounded group of books! What’s your advice to someone interested in starting their own business? Be prepared to put in as much work as you want to get out of your business. It’s a lot of hard work to start your own business or company – and can be a terrifying leap of faith. If you work hard, and understand it’s going to take time, love and determination to reach your goals, the rewards you reap will be worth it. Where do you receive inspiration? I get a lot of inspiration from Pinterest these days – as well as movies & TV shows. I like being out in the world and gather ideas from real people I see on the streets, or cool locations & towns I drive through. They all inspire me to create the images I envision. Elon Musk. That dude is a whole lot of crazy genius. What is your indispensable gadget? It’s so clichéd, but my iPhone. I use it for everything – getting in touch with my friends, directions to places, listening to music, tracking my runs, and taking photos! What’s your favorite app? The “weather.com” app is probably my most used app because my job depends on it! I do my photoshoots 99% outdoors– and the Northwest is notorious for it’s difficult to predict weather reports! I need to make sure every day that I have a photoshoot scheduled it’s not going to rain – and the weather report can literally change within hours – so I’m constantly checking the radar and forecast! What’s your favorite account to follow on Twitter? Definitely the @seahawks – I’m a HUGE football fan and during football season I get really in to life tweeting during the games! What’s your favorite item in your closet? I have this killer printed jumpsuit I found at Forever 21 a few years ago, and somehow it happened to be made out of high quality material because I wear it all the time and it still looks brand-new. It’s so easy to wear and is really fun and funky.